Many young readers and families with children have enjoyed the vividly illustrated, rhyming Heroes for Young Readers books. Now these popular children's books are supplemented with the new Heroes for Young Readers Activity Packs. 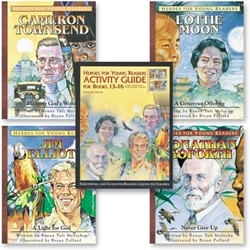 This activity pack also includes the activity guide that covers all four books. The items in this Activity Package can also be purchased separately.